Below are some hints on how to open these toothbrushes and replace their internal rechargeable batteries. The Vitality Sonic can be opened by putting the brush on its charger and twisting it anti-clockwise a quarter of a turn. The base cap of the Advance Power 4716 also needs to be twisted but by using a flat metal bar between the notches in the rim of the base. The Pulsonic models have a screw holding the base cap in place, and once the cap’s removed you can release the catches and slide the insides out. Be aware that the original Pulsonic models had Li-ion batteries rather than the lower voltage Ni-MH batteries used in the slim version. With the Sonicare PowerUp insert a large flat-head screwdriver in the centre of the base cap and turn it anti-clockwise a quarter of a turn. You can then pry the cap out and release the clips holding the innards in place using a smaller flat-head screwdriver. If you need further hints on changing the battery in these models or any others just ask us in the comments section below. Likewise, please tell us your tips and experiences with these brushes and other models! Previous post: European Union Customers can still buy from our Shop! I have a 3737 model without any kind of collar at the brush end. In other words, the mateal shaft emerges straight from the body/handle without passing through any external sleeve. I’ve remove the base but, other than pushing VERY, VERy hard on the end of the metal spindle I dont see how to get the innards out. Is there a trick? Hi Ed, with the Vitality Sonic there can be varnish around the shaft where it goes into the external collar. If you chip this varnish off you should be able to push the shaft into the housing. Indeed you are right! the only way to get it out is pushing very hard the tip of the metal shft. The way I used is to hammer the tip very gently so that it gradually sinks. 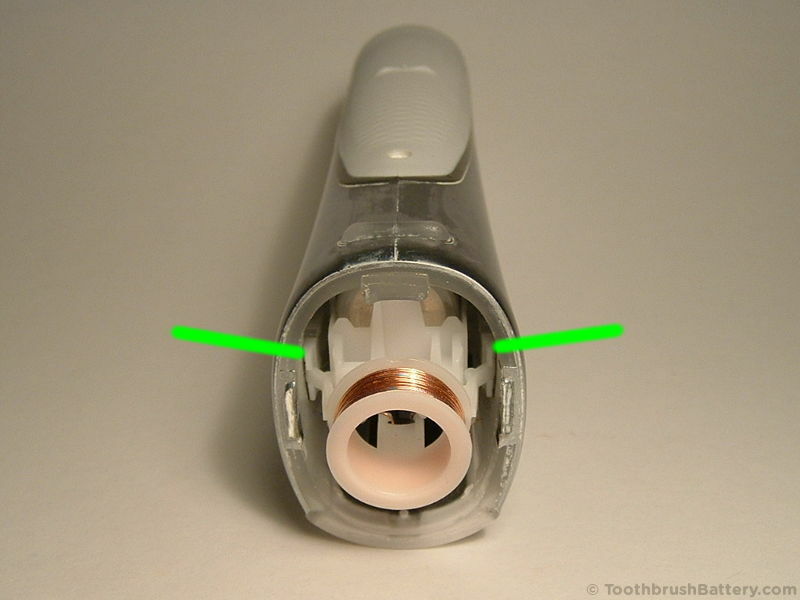 I have a Philips Sonicare Flexcare HX6950 and would appreciate any guidance you have on swapping the battery. The FlexCare models (HX6900 series) have very similar handle casing and internals to the EasyClean models so you can use our Sonicare EasyClean repair guide to replace the battery. I have a Braun Advance Power 4716 and the battery no longer holds a charge. I’ve got the battery out, it’s a Ni-Cd one, but no mAh marking. All it has is 430LH SAN. It is 49 x 14mm, with in-line tags. I can’t trace this battery at all online. On your ebay page you have a 700 mAh rechargeable battery, Ni-Cd, same dimensions suitable for a shaver. Not sure my question to you has got through on ebay, so I’m trying again here. Do you think this battery would be suitable as a replacement for my toothbrush please? I don’t want to swap to a Ni-Mh one in case the charger doesn’t work properly. Hi Susan, Yes if your original battery is a Ni-Cd battery you can replace it with one of our Ni-Cd replacement batteries with solder tags, of the same dimensions. Hi, I have a Philips Sonicare HX5350/02 on which the battery seems to be failing. Can you help me to work out how to replace it please? thanks. Hi Simon, Your CleanCare looks similar to the old Advance/Essence models. There are some instructions on opening these brushes here. We have Ni-Cd toothbrush batteries available here in our secure online shop. I have a Salton Ultrasonex Phaser toothbrush. Do you know how to change the battery? Hi Simon, that’s not one I’ve seen before. Checking for an Ultrasonex Phaser online it looks like it might come apart in the middle somehow – though if gently twisting it doesn’t seem to do anything I’m not sure what method to suggest! Any help replacing a Sonicare HX6210 battery would very much be appreciated. The HX6210 probably comes apart in the same way as opening the Sonicare DiamondClean toothbrush, i.e. by alternately squeezing the sides together, then the back-and-front together, to make the base cap pop out slightly. It looks like the Sonicare HX6200 series are fitted with Ni-MH batteries so a suitable replacement battery should be available in our secure online shop. Can the Rota-dent electric toothbrush battery be replaced? If so, What kind of battery? and is there a guide or how-to directions for DIY installation? Yes the battery in the Rotadent electric toothbrush can probably be replaced, but we have no instructions on how to open it to inspect the battery. My question is there a replacement battery still available for it? Yes, many of the type 4713 Braun/Oral-B toothbrushes were fitted with a 56mm x 17mm 2.4V battery. If yours is too then see our Sonic Complete Toothbrush Battery for a potential replacement. I have an old BRAUN Plak Control Type 4726. Voltage mesurement : 0.6v (seems battery out of order). Trying to charge it (with an external charger), Max voltage 2.83V. I’m waiting for 1 hour. Where i can find this kind of batteries, i’m located in France. Bonjour Fred, yes the Type 4726 is very old! We sell a battery pack made of 2 cells for the Sonic Complete and some Plak Control models here. This should fit your toothbrush if you add a little padding around the battery. It is the correct voltage. Recharge it for 24 hours maximum. I have an Oral B Pulsonic (not the SLIM). Is there a replacement battery available? The original li-ion battery has 4,1 V and 530 mAh. Its dimensions are 43mm x 18mm. The original Pulsonic brushes (Type 3722) took a 43mm long, 14mm diameter Li-ion battery so you might find that your battery is 14mm diameter. Li-ion batteries used to be rated at their maximum voltage which is 4.1V or 4.2V. Nowadays they are rated using their average voltage which is 3.6V or 3.7V. Either of these is suitable for replacing your Pulsonic battery. They are not available with the studs on the ends but you can often fold up metal tags fitted to a battery into a concertina shape ( /\/\/\/ ) to give a good connection, or solder the tags to the contacts. This battery on eBay should be the correct size for your Pulsonic toothbrush. Is there any corrosion on the metal battery contacts inside the brush? These brushes take 2 AA batteries. Make sure you have used either alkaline disposable batteries or fully charged Ni-MH rechargeables. Also see our toothbrush care guide for tips on looking after your electric toothbrush. I have a Oral B Pulsonic. I removed the screw and the cap as described below but I cannot slide the inside out after releasing the catches. What do I do wrong? Please help. Hi Isabel, the trick is to make sure that both catches are released at the same time. Then you should be able to push the plastic head-connector up inside the casing of the handle to slide the insides out. I just got a new Pulsonic Slim in a private sale, but box still sealed. It’s charging now (green light ON), but as soon as I lift it from charger it starts to vibrate and can’t switch off – only in the charger it’s off. Is it defect? That is strange! Did you try to switch it on before the first time you put it on charge? What happens if you leave it on charge for 24 hours until it has finished charging, and then remove it from the charger? I just got it a few hours ago. It was totally dead. It’s charging now for maybe 3 hours. I will leave it untouched on the charger now. Will the green charge light be off when it’s full? Yes the light should go out once it’s charged. Let us know how you get on! Now 24 hour green light is still on. No change. when I take it out of the charger it start immediately to vibrate. Can’t switch off, can’t change to sensitive mode. It does make those micro stops every 30 Seconds though. I wonder if the tact switch might be jammed. I may take it apart and have look. May hook the battery also to my external NiMH charger. I have some EE background. What happen if you keep pressing the button while taking it out? I doubt that you can switch it on whilst it’s charging. Have you tried taking it off the charger then when it is running hold down the power button for 3 seconds? This might switch it off. Perhaps if you dismantle it then disconnect the battery and reconnect it, that might solve the problem. The battery appears to be recharging so that part of it is working! Now about 60 hours later the charge light is still on. Same error. I wonder if the battery might be damaged. The unit was never used and probably in the box for a long time. After unpacking the battery had zero charge. I wonder if the brush will misbehave with a too low or too high voltage? So far I did not disassemble it. The battery sounds like it’s charging okay. If you cannot return the toothbrush for a refund then perhaps open the brush and disconnect the battery. Leave it disconnected for 24 hours then reconnect it and see if the brush behaves correctly. Not much news, I dissembled the 3714 (not that easy first time!) and did a controlled discharge via a R100. While ~100mV I had a look at the tactswitch – all sides are shorts. I didn’t took it out yet, so I don’t know the resistance of the circuit behind it, but that looks already a bit suspicions. I probably don’t have that type tactswitch around. To unsolder may need to take the mainboard completely to avoid plastic melt. I am close to electronics and have the required tools. Is there anything known if the switch can be tested on board? Update on the switch. It seems to work. Open it’s 300 Ohm (with the circuitry behind it) and closed it 0.3 Ohm. After total discharge to below 100mV it back to the charger for 24h. The green LED is not lighting so far. Some updates, again. I didn’t do much with the brush. It’s on the charger stand in a semi-assembled stage. Today I took it out and it started again to vibrate – but today the switched worked, I could switch to ‘sensitive’, and then to ‘off’. Sometimes, not always. When I manage to switch it off, put it back to the charger stand, take it out again, it will start again immediately to vibrate. When I do not put it back on the stand I can use it normally and the on/off/sensitive function works well – as long as I don’t put it back on the charger stand. Hi. I am trying to replace the battery on a Braun Oral B type 3764 but it doesn’t seem to match the description in your tutorial. This may be because it’s the bluetooth version. Anyway I have the bottom off & the small collar at the top but can’t get the innards to move. Help! Hi Roger, On the v2 Triumph toothbrushes the innards are held in place by clips at the sides. Pulling the coil out by 4-5mm normally causes the side clips to retract so you can slide the insides out. This might break the coil wires but they can be resoldered. Alternatively use 2 small screwdrivers to release the clips on both sides simultaneously. Thanks for the reply. I have those clips loose but that doesn’t seem to be what’s holding it. I have a Braun type 4736 which has stopped working – suspect battery but cannot find the model in your helpful guides. Can you tell me which battery to order and any special tips about how to open. Is it a twist of the base or a lever backwards or something else ? I have also sent an email before seeing this page. Hi Chris, the Type 4736 is almost the same as the Type 3728. See our Type 3728 battery replacement guide for details! Hi, You can open up the HX6200 brushes using the first part of our Sonicare DiamondClean opening instructions here. The battery in the HX6200 is different and they are available on our eBay listing here. Have a read through of our troubleshooting tips here. It sounds like it could be the coil wires. Is there a chance that i have put the battery +- wrong? Could it cause a no charging result? If you had reversed the polarity it would either not work at all or would run unstoppably. It sounds like the polarity is fine and it’s more likely to be a broken copper coil wire or a solder bridge/short.